Between my accounts, in the past couple of days, I've killed 3000 blazes by hand with a Looting III sword and received no heads. I've also been asking in chat constantly to buy them, and haven't seen any being sold, nor do I see any on the AH. I've contacted the few people who have gotten past rank 4, and it seems there was some sort of change in the drop rate since they did it. 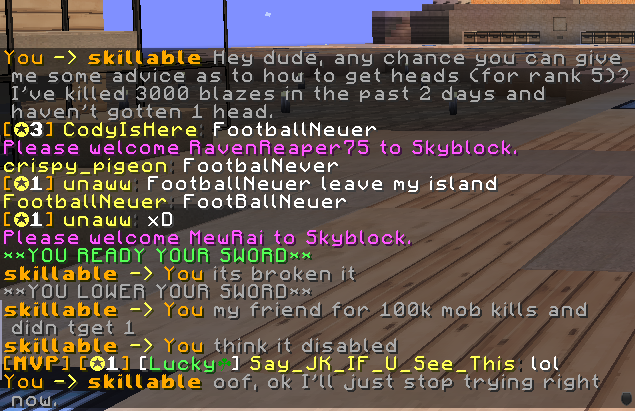 Skillable says a friend of his has killed 100k mobs recently and received no heads. Please look into this as it's the current bottleneck to get from Rank 4 > 5, and to get the next cobblegen upgrade. I recommend you try again as the new update fixed multiple bugs and glitches. If the problem continues, contact a moderator so they can get in touch with whoever. It would be horrible to do all that hard work for nothing. Good luck. Nope . I just killed about 1000 blaze with a looting III sword. Zero heads. Asked in chat, had a couple of people confirm. You might have to try and use the headless enchantment on your sword; it increases the chance of blaze heads dropping, and I don't really know if blazes drop heads with looting 3 either. Almost positive that Headless only applies to pvp kills, though this is a viable method for obtaining heads. Since my original post, Wither skulls have become prevalent in the auction house due to people being able to afford Wither spawners, so I believe this has fixed the bottleneck in getting to rank 5. It may be intended that only Wither's drop skulls. I think it's very likely that withers are the only ones to drop heads because according to recent auctions, there are no other heads but the wither skeletons. I'll report this to see if this is just a bug or if it's meant to be like that. It takes a while, but the other way to get heads is through the mob grinding quests. Each of the skelly/zombie/spider/creeper quests includes two heads as rewards. Quests cycle around every couple of weeks. Okay, so yes, wither skeletons are the only way to get heads without having to complete quests that may or may not appear, but as of recently, on Skyblock, wither skeletons are broken. Mhm. 7.5 million dollars worth of a spawner and they don't even spawn. I really hope Dacon is working this out, but until he does, I would suggest using iron golems and getting the headless enchantment on a PvP sword and killing players to get their heads. Sorry.